At the core of IJM Land’s responsibilities, priority is placed on the development and sustainability of the four main pillars of the larger business ‘ecosystem’ within which we operate: the marketplace, the community, the workplace, and the environment. IJM Land is intrinsically aware that it is not so much what goes into building a house that is as endearing or important to our customers, but more so what comes out of living in them as homes. This is the reason we place great importance in enhancing lives through our residential and community efforts. We thus frame our every action on and around how we manage our business, relationships and processes to produce an overall and sustainable positive impact in and on society. IJM Land invested in community-based sports events encouraging healthy urban lifestyles that took place at our townships. 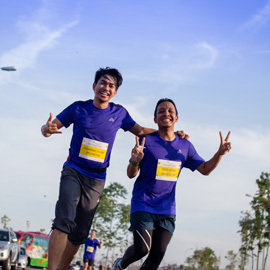 We organized a fun ‘Run with Me’ held at the Bandar Rimbayu township on 15 July and the IJM Land Half Marathon at the Seremban 2 township on 12 August, attracting close to 11,500 participants collectively. 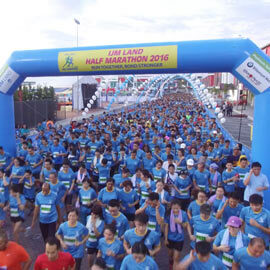 IJM Land Half Marathon provides an additional platform for the community to contribute to charity, raising RM20,000 each for Pertubuhan Hospice Negeri Sembilan (Hospice) and the Malaysia Lysosomal Diseases Association (MLDA), to fund their programmers and activities. In the spirit of physical health awareness, the IJM Land Half Marathon also provided the community with free health screenings through our medical partner, Columbia Asia Hospital. In support of maintaining community green lungs as well as encouraging appreciation of nature that surrounds communities here in Sebana Cove, IJM Land organised an eco-trip that educate students from Sekolah Kebangsaan Bandar Penawar 2 about surrounding wildlife, birdlife as well as the local flora and fauna, an important part of the Sebana Cove ecosystem. We use our 1,200- acre development as a context for teaching, extending learning beyond the classroom walls and into natural environments. IJM Land appreciates that the needs of lower income families and the unfortunate are particularly pressing, especially at times of festivals where the burden of costs are increased. In the spirit of Hari Raya, IJMers show their care and concern for the poor and the needy in the community by donating cash, daily essentials and clothing to six (6) underprivileged families in Seremban to ensure the families would be able to celebrate Hari Raya. We also donated a walker to a needy individual with mobility difficulty. 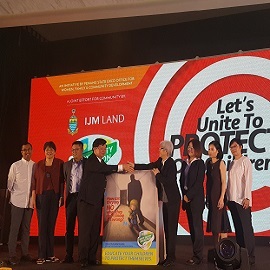 In Penang, we supported the Penang State Government’s noble fight against child sexual abuse via its “Body Safety Education” campaign and book for educators, parents and guardians. 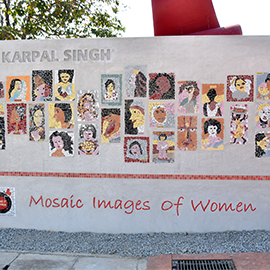 In celebration of International Women’s Day 2018, IJM Land lent its expertise to the construction of the Women’s Mosaic Wall, a permanent feature and a future significant landmark located at Karpal Singh Drive in Penang. The first-of-its kind mosaic wall incorporated 74 distinctive art pieces which portrayed images of women were made by over 200 Penangites to raise awareness of women's contribution to society. IJM Land continues to enhance the lives of underprivileged through it signature Home Rehabilitation Programme launched in 2010. 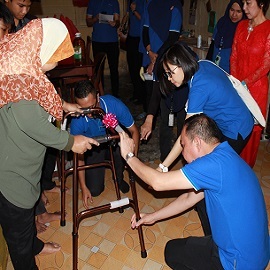 This year, through a united effort, we successfully adopted and revamped the homes of two families, one in Seremban, Negeri Sembilan and one in Padang Besar, Perlis. The programme also received massive support from our contractors and suppliers, serving as a key initiative for engaging and inculcating a culture of corporate responsibility among our business associates. IJM Land is always committed and at hand to help the needy in the community. 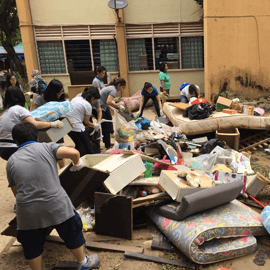 In the aftermath of Penang flash flood, IJM Land deployed 80 employee volunteers to the affected areas to assist residents with the general clean-up efforts and restore their homes so the residents will be able to resume a normal life soon. The company also dispatched 12 machineries and lorries including backhoes, mobile crane and trucks to help remove fallen trees, and to ferry debris and waste. 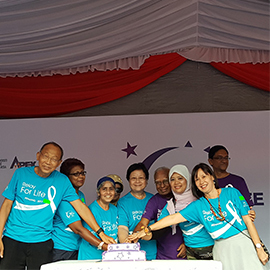 IJM Land was a proud sponsor of the Relay for Life 2017 and donated RM10,000 to the noble cause, which provided financial aid to the beneficiary of the charity event, namely the Penang branch of the National Cancer Society of Malaysia. IJM Land sponsored and participated in the 40th annual Penang Starwalk 2017, which involved over 20,000 participants for a day filled with family fun. 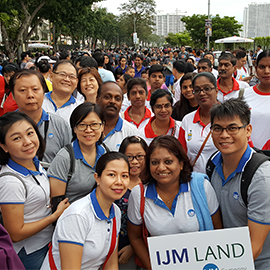 As part of the event, IJM Land contributed RM10,000 to the Community AIDS Service Penang (CASP) in order to help reduce the centre’s financial burden and IJM Land’s senior management and staff also participated in a 1km walk together with staffs from CASP. IJM Land is an active advocate of healthy living. We believe that community-oriented, family-friendly runs are good platforms in building healthy communities and fostering 'neighbouring' ties. In 2017, IJM Land organised two major running events that are synonymous with the townships it is developing; Bandar Rimbayu’s “Run with Me” 2017 on 9 July and the IJM Land Half Marathon 2017 in Seremban 2 on 13 August. Both events attracted record turnouts, with around 2,000 runners and 7,500 runners respectively. IJM Land is title sponsor and organiser of signature running events that take place around the company-developed townships. IJM Land's Pantai Sentral Park was the official partner, title sponsor and also a venue sponsor for P.S.P King of Forest 2017. 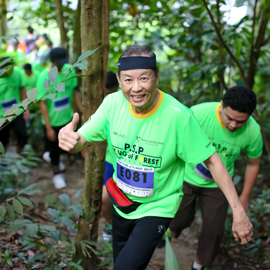 The forest trail run took place at Taman Rimba Bkt. Kerinchi on 16 July and attracted 1,500 participants taking part to raise funds for National Cancer Society Malaysia. 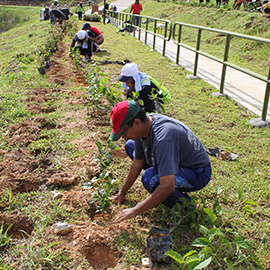 IJM Land joined forces with Majlis Perbandaran Nilai to undertake a half-day gotong royong session to tend to the green lungs in the Kawasan Lapang Perumahan Melody, Saujana Prima Seremban 2 Heights neighbourhoods and to clean the surrounding vicinities. 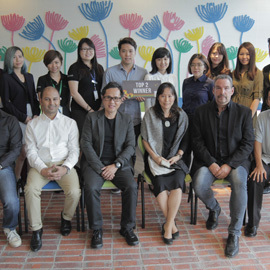 IJM Land is a strong advocate of the Asia Young Designer Award (AYDA) which aims to discover, develop and nurture a new generation of talents in the fields of architecture and interior design. 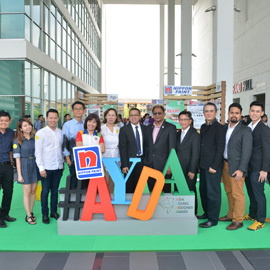 Our three-year partnership with Nippon Paint Malaysia Group for AYDA sets out to bridge links between design education and industry. In support of this initiative, all AYDA gold and silver winners in the architecture and interior design categories are offered internships at IJM Land. 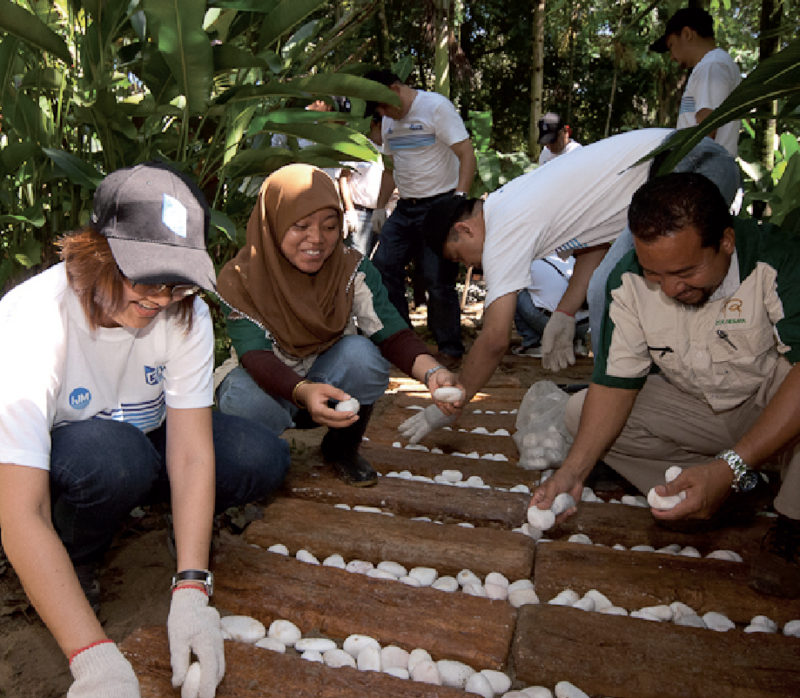 Over two weekends, 2,000 IJMers across IJM’s Property, Construction, Infrastructure, Industry and Plantation business divisions participated in a clean-up and maintenance of 12 nature trails in several regions across Malaysia and India during its Give Day Out (GDO) corporate social responsibility (CSR) initiative. 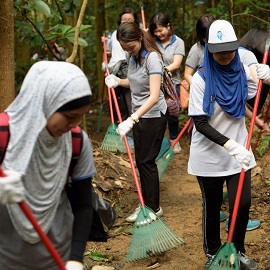 Themed “Fun with Nature” with a focus on environmental preservation, the event marked IJM’s second Give Day Out this year, making this its seventh outing since the CSR activity began in 2010. 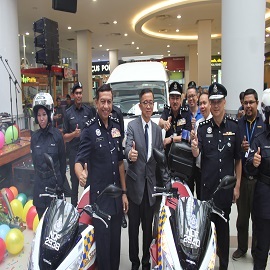 Delivering on our commitment to community safety, IJM Land donated to the local police force one Toyota Hiace window van designed to serve as a mobile police station and two fully equipped Honda PC X 150 motorcycles to support existing security efforts in Seremban 2. 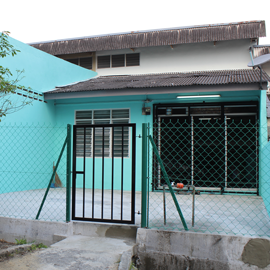 Through a united effort, IJM Land successfully adopted and revamped the homes of two families, one in Kampung Seronok, Bayan Lepas (27 April 2016) and one in Kampung Baru Rasah, Negeri Sembilan (15 November 2016). The programme also received massive support from our contractors and suppliers, serving as a key initiative for engaging and inculcating a culture of corporate responsibility among our business associates. 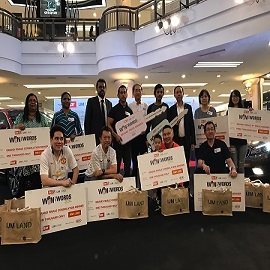 IJM Land has collaborated with The Star Media Group and supported their Win with Words contest, where the newspaper readers stand a chance of winning more than RM480,000 worth of prizes by forming words with alphabets published in the daily. The contest motivated entrants to expand their command of English and encouraged family participation and interaction as well. 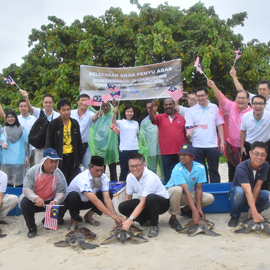 As part of our joint pilot conservation and research project with the Turtle and Marine Endangered Species Research Centre, part of the Department of Fisheries Malaysia in Rantau Abang, Terengganu, IJM Land released 30 green sea turtles (Chelonia mydas) aged between 8 and 30 months to their natural habitat on Teluk Bahang beach in Penang. Collected as tiny hatchings from a conservation centre, the turtles were raised in the seawater pond of THE LIGHT Waterfront Penang’s waterways. Results from the first phase of the programme, which launched in 2014, proved encouraging. The turtles’ high survival rates of between 70% to 80% indicated that the waterways provide a conducive environment for marine life to thrive. Further IJM Land and Fisheries Department collaborative efforts are also in the pipeline to utilise the waterways for future breeding and rehabilitation programmes. IJM Land organised its 5th running event in Seremban 2 township, IJM Land Half Marathon 2016 with a tagline of “Run Together, Bond Stronger”. 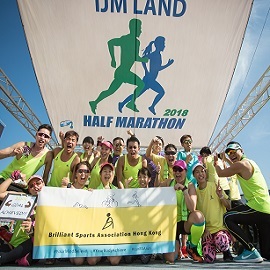 The IJM Land Half Marathon, which featured a 21-km run and a 10-km run, attracted some 6,000 participants to run for a good cause. As a developer for the people, IJM Land has made it a priority to promote a sporting and active lifestyle to community members of all ages and walks of life. IJM land organised its 2nd running event for its local community, #runwithme in Bandar Rimbayu township. 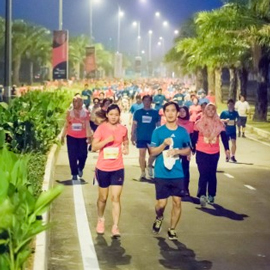 #runwithme, which featured a 10-km fun run, attracted some 2,000 participants. 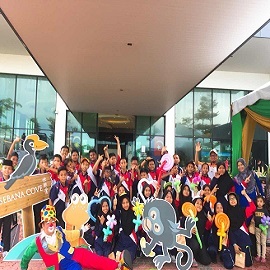 In our effort to advance the learning of young children in the fields of science and technology through immersive and exciting experiences, IJM Land contributed RM1 million towards the Tech Dome Penang, the state’s very first Science Discovery Centre. 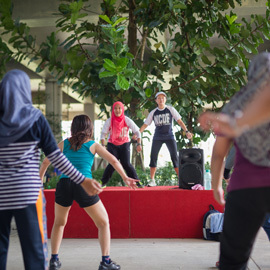 As consumers are getting more health-conscious, Bandar Rimbayu organises free community events and activities such as Zumba, stretching and toning workout and kids bootcamp every Sunday at The ARC to encourage healthy lifestyle and to reinforce family bonds. 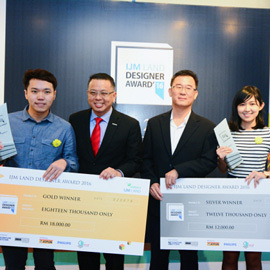 IJM Land announced the winners of its inaugural IJM Land Designer Award (iLDA) 2016 themed “Reliving Nostalgic Memories”. iLDA 2016 is a platform to provide design graduates the opportunity to turn their designs into reality. The initiative was aimed to encourage new ideas and techniques in the design and furnishing of interior spaces for multi-family living, taking into consideration the efficient layouts, privacy and spaces for leisurely pursuits. Leo Wong Kwan Theng emerged as the Gold winner while Goh Sow Yee was the silver winner. For the last two months, both contestants fully furnished a Penduline showroom in the Bandar Rimbayu township under the theme of "Reliving Nostalgic Memories". 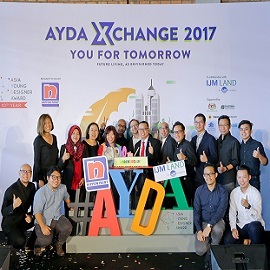 IJM Land continues to support the AYDA (rebranded from Nippon Paint Young Designer Award), which aims to nurture the next generation of talents in the fields of interior design and architecture. For AYDA 2016, the theme “Be Bold. Be Free. Be You.” is tailored to inspire young interior designers and architects in birthing new and refreshing concepts that encapsulate boldness, freedom and originality. IJM Land offers 6-month paid internships to gold and silver winners in each category. During the year, IJM Land organised two runs for our local community. 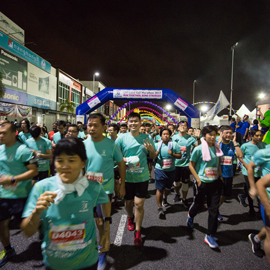 Our two signature running events – the IJM Land Run in Seremban 2 and Run with Me in Bandar Rimbayu have grown strength to strength and year on year. This year’s events attendance has been the highest recorded yet with the annual IJM Land Run 2015 proving to be a hot favourite with a record number of 4,000 participants taking part in the various disciplines to raise funds for designated charities. Launched the Community Art Program that provides opportunities for our local artists to create art, display their creative talents and integrate into the community. 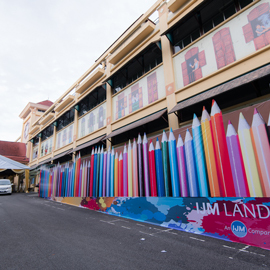 Pasar Seni Seremban was converted to display paintings, drawings and handicrafts from the local community, providing spaces for creative expression and social integration. The newly transformed Pasar Seni Seremban comes alive every second Sunday of the month from 8:00am to 4:00pm with an eclectic programme of events. 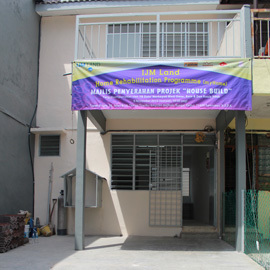 On 6 November 2015, through our signature CSR programme, the Home Rehabilitation programme which serves to provide better living environments to the less fortunate, IJM Land’s property division in Seremban reconstructed a badly damaged family home at Taman Tuanku Ampuan Najihah, Sungai Gadut in Seremban which was gutted by fire and left in a barely liveable state. 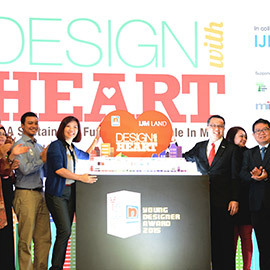 In active support of innovation in the industry, IJM Land launched its first ever IJM Land Designer Award (iLDA) 2016 at its Bandar Rimbayu township, with the aim of providing design graduates the opportunity to turn their designs into reality. 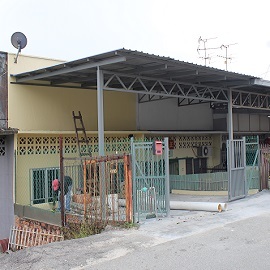 The initiative is aimed to encourage new ideas and techniques in the design and furnishing of interior spaces at the Penduline double-storey houses in Bandar Rimbayu township. A proud supporter of our local artist communities, we partnered The Edge Galerie to bring the works of the emerging and established local artists to the community. 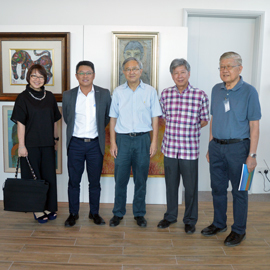 In September 2015, we supported the ‘ Penang Art: Then & Now’ exhibition to promote a greater appreciation of Malaysian art principally produced by prominent artists associated with Penang. 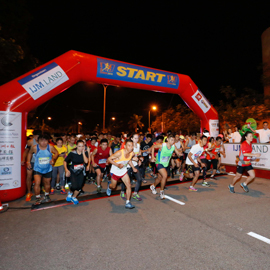 More than 4,000 runners and supporters took part in this year’s IJM Land Run on Sunday morning (9 August) at Seremban 2. Together, they run in the various disciplines to help raise funds for Pertubuhan Hospice Negeri Sembilan and Malaysia Lysosomal Diseases Association. IJM Land is a proud partner of the Nippon Paint Young Designer Award 2015 for the second year running to nurture young talents and spark greater creativity and inspirations amongst architecture and interior design students. The award, which offers two competition categories namely Architecture and Interior Design, has garnered an international recognition by providing a platform for emerging designers to share their ideas with industry experts. IJM Land launched its Rumah Selangorku affordable housing project in its 1,879-acre Bandar Rimbayu township as part of its nation building efforts. The project will comprise 15 blocks of residential apartment that consists of a total of 2,330 units with built-ups ranging from 700 to 1,000 sq ft for its 3-bedroom and 2-bathroom units. The launch was officiated by Dato’ Menteri Besar Selangor, Tuan Mohamed Azmin bin Ali. As a thoughtful developer, IJM Land offers affordable housing projects in its suite of developments including Bandar Sri Pinang in Penang, Seremban 2 in Negeri Sembilan, Shah Alam 2 in Bandar Puncak Alam and Bandar Utama in Sandakan. IJM Land has partnered with The Edge Media Group in support of The Edge Galerie, an art gallery here that focuses on Malaysian and Southeast Asian art. As part of the partnership, IJM Land will support activities such as auctions and art exhibitions organised by The Edge Galerie which promotes and advances art investment and appreciation. 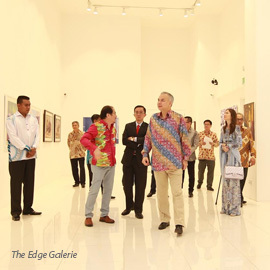 IJM Land’s partnership with The Edge Galerie is a natural extension of our passion in providing a destination for artists and art enthusiasts to connect and be inspired by art, in turn creating greater visibility for the emerging and established Malaysian artists. Admission to The Edge Galerie is free.